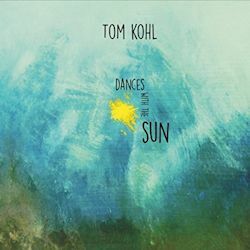 Pianist Tom Kohl opens his album Dances with the Sun with a sequence of arrhythmic Monk-like gestures on Tymus that are supported by the determined and strong bass playing of Steve LaSpina and the meshed interplay of drummer John Doty. It inaugurates a diverting disc in which a number of influences – Monk included – can be inferred. But the good news is that they are not allowed to hold the pianist or his group in thrall. Take Can I Ask You a Question? which is a thoughtful, poetically interrogative number that even aspires to the status of refined chanson. Its richness is never arch and even the benignly titled A-Flat Tune springs some surprises sounding rather like early Keith Jarrett with its rhythmic freedoms and inflections and, not least, catchy thematic writing. Kohl’s trios – sometimes LaSpina is the bassist but on two tracks Stephen Roane takes over duties – are democratic organisations. LaSpina takes a strong role on the title track, his full, rounded tone being eminently well recorded, and Doty’s drum work is similarly athletic and forward in the mix. Kohl has the gift of crafting catchy themes which is good news given that all the compositions, bar two, are his own. Take Stick Figure which, with its metric displacements and stop-start rhythm offers listeners a strongly propelled and witty five minutes’ worth of vitality. Carbonesque sounds like a kind of cousin to A-Flat Tune, its slightly Gospel-tinged phraseology and attractively communicative themes being equally viable. The standards are Victor Herbert’s Indian Summer, which makes a perhaps unexpected appearance, and Lover Man rather less so. The former, however, turns out to be apt, given Kohl’s predilection for songful warmth. Lover Man is bathed in a light Latin wash and Doty emphasises this element with persuasive subtlety. It’s interesting that this is by some way the longest track. Kohl and his trio (or trios) offer some vibrant and engaging music-making in this 50-minute disc.